Each roll contains 15-foot of test paper and matching color chart. Provides for approximately 100 tests. 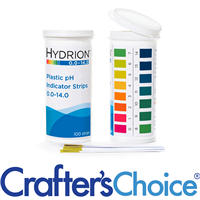 Hydrion Insta-Chek pH Paper, the ultimate in wide range, general purpose pH papers has a distinct color match at each full pH unit:[0.0][1.0][2.0][3.0][4.0][5.0][6.0][7.0][8.0][9.0][10.0][11.0][12.0][13.0]. Tear off paper strip and emerge in test solution. Remove strip and immediately match to color chart for accurate pH measurement. COMMENTS: Great way to test PH. "PH Test strips used in hot process soap"
COMMENTS: I like to check the ph for handmade hot process soap. "pH Test Strips - Paper Roll"
COMMENTS: These strips make it very easy to check my cold process soaps. The paper roll is economical to use. COMMENTS: These are a big help in soap making. COMMENTS: I have purchased these 2x the first came yellow the next green. I tested them against other strip and neither of the 2 I purchased worked. WSP Response: Please contact our office so we can get further information from you. We will need to contact our supplier to check this out further. COMMENTS: This strip is very handy. I use it to test my soap. It tears easily, so I can use smaller pieces of it. Lasts a good long time. Easy to read/check result with the ph color bars on the side. Won't be without it. COMMENTS: I love this paper it makes feel safe about selling my soap. I know the lye process is complete when I test my hot process soap. These strips are perfect! COMMENTS: Can't tell if this works, always reads the same on all that I test, either I have been lucky that all my items have been spot on for safe ph range or there is something up with the paper, like the way I can use what I need so as not to waste the paper and it's fairly easy to read. COMMENTS: I am new to soap making and needed something to use to test my soap. This is great I can just use what I need. Great Product. COMMENTS: I wouldn't consider selling soap without using these first. It's always better to be safe than dealing with unhappy customers! COMMENTS: I have used these pH test strips on at least a dozen CP batches. I've used the strips after un-molding the soap AND after the cure and I always get the same reading. I find the colors to be too similar in color to tell the difference. I'm not sure they are very accurate. I will not buy again. COMMENTS: I wasn't sure how to use these because it didn't come with direction, but i just googled it. It seems as they work but many people say PH strips are not accurate. COMMENTS: I like to cut these in half to double the amount of strips. It is a pricey item, but absolutely necessary. COMMENTS: I am very relieved to have this product to reassure me that my soaps are chemically balanced! They were very easy to use and easy to read. The only thing I'm not sure of is if I really have to pull as long a strip as the color dividers seem to indicate. It seems just as well to cut a small strip and save product. COMMENTS: These test strips are invaluable (and the only method that I know of) to test the ph level of your lotions. It's critical to know that information so you know which preservative to use (if you're using one). I'm thrilled that I have them! Saves wondering . . . COMMENTS: I really like this product. I can tear as much or as little as I need. I like the comparison chart right on the dispenser. Put my mind to rest as to the product I was creating! COMMENTS: I have always purchased my litmus paper from a chemistry store. The roll found here is more economical and just as acurate. The casing makes it easey to tear a piece off for testing, even when wearing gloves. All in all it is a wonderful tool for any crafter. COMMENTS: The roll is very easy to use and gives accurate readings. COMMENTS: Works really well for my cold process soaps! COMMENTS: This was exactly what I was looking for, so thanks. Easy to use and lets me know my soap is safe to use. Can use a very small amount and way less packaging. COMMENTS: An absolute must have! COMMENTS: Love the quick and easiness of this ph role. I really like that fact that I do not feel like I am wasting. The ph sticks have always made me feel like I'm wasting my money and paper. This little roll is def more bang for your buck! "essential when using essential oils"
COMMENTS: since ive been using essential oils in my creams and lotions. this is something i absolutely cannot work without. COMMENTS: This is a great tool to double check that I've have done my math and measuring correctly. Gives me peace of mind, and today, that means a lot!!! COMMENTS: I use this with every batch of CP that I make....it gives me piece of mind that no mistakes were made. You only need a small piece so the roll can last quite a while. I like that the colors aren't too similar with each other...makes it easy to understand what your reading is. COMMENTS: Until someone shows me a faster, cheaper or all around better way to ph test my soap, I will be using these. COMMENTS: I use these with new soap recipes to be sure my bars are safe. You only need to use a small piece of the strip for an accurate reading. Goes a long way. COMMENTS: This is a great item for testing my cold and hot process soaps while I'm making them -- the pH paper is easy to read, as the colors vary enough from one pH to the next to make them distinguishable. So glad you offer this! "Can these strips be used to test the pH of all hair products?" Staff Answer Yes, these strips can be used to test the pH for any of your products. "I jjust made by first batch of cp soap and its been curing for 5 weeks now. I tested it with the ph strips and it looks like its reading between a 7 & 8. I am not sure if I should cure these a little while longer. My question is this: What ph is the best & safest for cp soap? Thank you for your help. " Staff Answer Normal pH for soap is between 7-10 so your soap is fine to use. Letting your soap cure for 4-6 weeks will give you a harder bar so you can decide if you want to use now or wait a little longer. "What's the difference between the paper strip and plastic syrups that cost double for the same quantity of tests? Is the plastic more accurate? I want to test, clay bath salts, salt scrub, body wash, and shampoo. Thanks "
Staff Answer Both the roll and the individual strips are accurate, the price difference is based off of our costs. "I'm not sure if I am using these right. I tested several soaps that are curing. I tested one that I just made a couple of days ago. All seemed to show between 7 and 10. The most recent soap zapped my tongue good so I know it still has lye that needs to cure out. I lathered each soap and put a small piece into the lather. Am I checking to see if my recipe is ok or if it has cured?" Staff Answer To properly test the pH you want to take some of the soap and make a slurry with water. Then test the pH. If you have lye pockets and the slurry does not include a pocket then you may get a false reading. Hi You seem very knowledgeable on all this Im trying to start making my own soaps,lip scrubs,body butter or lotions and still have alot of questions. "Do I need to use these pH test strips when making foaming face wash, bath salt with essential oils and body butters? Please help? " I would advise using the PH strips with anything that comes in contact with skin or hair. "Do you use the test strip after the soap is unmolded and cut, or do you wait until it has cured?" After cure, as the soap can still have some lye remaining during the saponification process for up to approximately 48 hours. As it cures, the PH will gradually decrease a little more. This is why many soapmakers recommend a 4-6 week cure to ensure a gentle soap. Once cured, you can wet and lather the soap up and test to make sure the PH of the soap is safe for use and sale. "How do you use these pH test strips? I was hoping that there were directions included, but there aren't any. Do you just rub it on dry soap, or do you have to wet the soap first? Sorry, I'm new to CP soap making, and I don't need to test my M&P soap. " Wet you soap bar and bring to a lather with your hands and then put test strip directly on the wet soap to test. You will not need to test your Melt and Pour soap because it should all the the same ph not like in cold process where the base changes. Welcome to the soaping world!